Driverupdate.net is the PUP that uses misleading techniques to prevent removal. Use Reimage to locate malicious components and get rid of them faster than with uninstall instructions. A full system scan blocks virus reappearance and prevents traffic to malicious domains. When and how Driverupdate.net adware infected my PC? Technically speaking, Driverupdate.net virus is not a virus because it cannot harm a computer or encrypt personal files. It’s a potentially unwanted program (PUP) that belongs to an adware category. Adware programs have only one purpose – to deliver as much commercial content as possible. Lots of pop-ups, in-text ads, and banners might fill all popular web browsers such as Google Chrome or Mozilla Firefox. Additionally, the virus can initiate sudden and unexpected redirects to various promotional websites. However, you will definitely encounter one specific Driverupdate.net redirect to http://driverupdate.net/lp/1/?p2=. 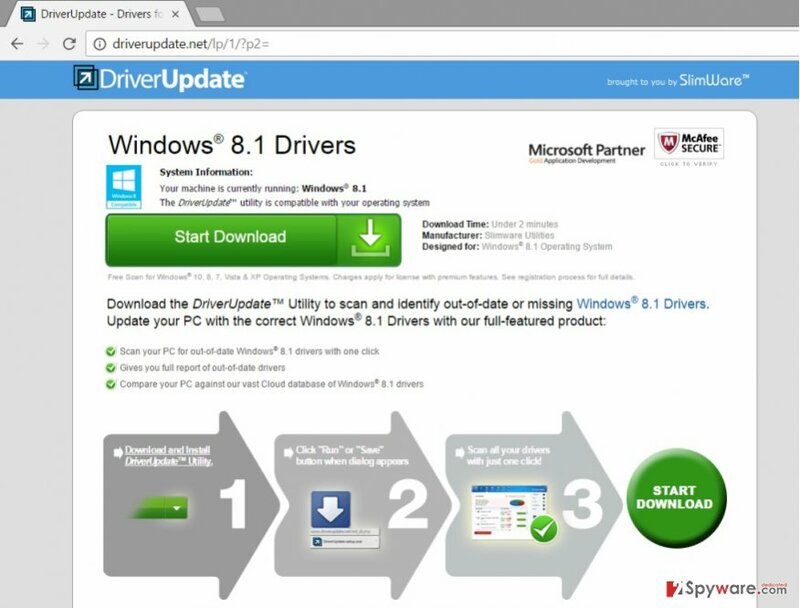 This site promotes DriverUpdate program which can scan and identify out-of-date or missing Windows drivers. The scan is free; however, license with premium features are charged. However, we do not recommend registering and revealing your personal details to the developers. We have some doubts about program’s credibility and efficiency. Some of Driverupdate.net ads also promote this program and offers to download it. You should stay away not only from these ads but also from those that suggest installing other questionable programs or updating software. You should know that these ads may be misleading and even dangerous. After one click you may install Trojan, ransomware or enter an infected website. Adware which is responsible for Driverupdate.net ads spreads bundled with other free programs and most of the time users install it by accident. Once it gets inside, it not only starts delivering annoying ads but also might monitor users’ online activity. Usually, adware programs track data and analyze it in order to deliver personalized ads. Sometimes developers may share or sell aggregated information to the third-parties. Since then you can expect even more suspicious commercial offers. Therefore, you should think about Driverupdate.net removal as soon as these ads start popping up on your browser. The longer you delay this process, the more ads you may receive. Some of them might be extremely annoying and cover the whole necessary content. You can easily get rid of this unpleasant features and remove Driverupdate.net with the help of Reimage or other reputable malware removal utility. Additionally, you can try to detect and eliminate adware manually, but if you need some help, follow our prepared instructions at the end of the article. Driverupdate.net hijack has occurred when you installed a free program from the Internet using recommended settings. It may have been PDF converter, one of many video players or another free app. However, you should not blame recently installed programs for being shady and installing adware without your knowledge. It’s only your fault that this sneaky program has been installed. You should have chosen Advanced/Custom installation mode and carefully monitored installation process. During the installation you might have seen the checkbox with optional apps, such as PC optimizers, browser extensions and so on. When you deselect these programs, you can continue and finish the installation without worrying that some unwanted programs manage to get on your PC. However, if you see Driverupdate.net pop-up ads after software installation, it’s a sign that you need to wipe out some adware program from your PC. Driverupdate.net virus is not a dangerous computer infection, but redirects and an excessive amount of ads are annoying features that should not be tolerated. Do not let adware live on your PC, track your browsing activity and provide suspicious commercial offers. Driverupdate.net removal will help you to run away from all these annoying activities. If you are an advanced computer user, you can opt for manual removal. Our team wants to give you a hand and offers to use a step-by-step guide presented below. However, if these instructions seem complicated or you deal with computer infections for the first time, you should choose easier way and remove Driverupdate.net automatically. To remove Driverupdate.net virus manually, you have to find and eliminate adware program with all its components. Then, you should check all web browsers that are installed on your PC because adware may have installed additional components without your knowledge. Here, look for Driverupdate.net or any other recently installed suspicious programs. Wait until you see Applications folder and look for Driverupdate.net or any other suspicious programs on it. Now right click on every of such entries and select Move to Trash. Check the list of add-ons and remove all questionable entries that may be related to Driverupdate.net virus. When in the new window, check Delete personal settings and select Reset again to complete Driverupdate.net removal. Follow the instructions and remove questionable extensions from the Microsoft Edge. Once these steps are finished, Driverupdate.net should be removed from your Microsoft Edge browser. Sort the list of extensions by installation date. If you see some suspicious extensions, uninstall them without hesitation. 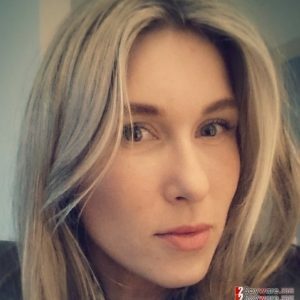 Here, select Driverupdate.net and other questionable plugins. Click Remove to delete these entries. Now you will see Reset Firefox to its default state message with Reset Firefox button. Click this button for several times and complete Driverupdate.net removal. Check the list of extensions and remove extensions that might have been installed by Driverupdate.net adware. Here, select Driverupdate.net and other malicious plugins and select trash icon to delete these entries. Click Reset to confirm this action and complete Driverupdate.net removal. Follow these steps and uninstall all questionable entries from the Safari. Here, select Extensions and look for Driverupdate.net or other suspicious entries. Click on the Uninstall button to get rid each of them. Now you will see a detailed dialog window filled with reset options. All of those options are usually checked, but you can specify which of them you want to reset. Click the Reset button to complete Driverupdate.net removal process. This entry was posted on 2016-11-30 at 06:41 and is filed under Adware, Viruses. You can quickly scan the QR code with your mobile device and have Driverupdate.net virus manual removal instructions right in your pocket. How did you remove Driverupdate.net virus?